This was one of the most relaxing and enjoyable Mother’s Days I’ve had in a long time. For no particular reason. My husband made us a pancake breakfast this morning and the girls gave me their presents. A homemade card, a picture, a flowering plant – all made at school – and chocolates from Sophie. 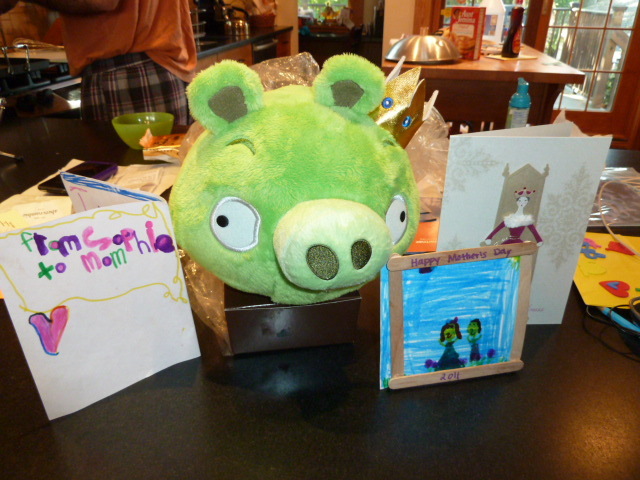 An “Angry Birds” pig from Chloe. The girls used their own money for the gifts, for the first time ever. And my husband heeded my strict instructions not to get me anything – hell, he’s my husband, not my kid. And I loved my gifts. They were perfect. Perfect because they were homemade, perfect because one of them involved dark chocolate hearts and perfect because one was a wink-wink acknowledgment of my latest gaming obsession, and the pig is cute to boot. Sophie has kindly given the pig permission to periodically hang out with her stuffed animal friends so it doesn’t feel lonely. The best part of the day, however, was the time we spent outside. I played tennis with Chloe in the morning, watched both girls play tennis outdoors during their respective lessons and had a picnic lunch on the front lawn. And we topped off the day for moms at my mom’s. Not bad, not bad at all.